Posted By:Unknown | At:7:54 AM Be the first to comment! 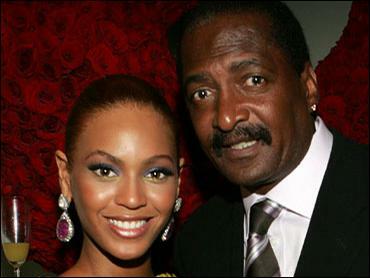 NEW YORK — Beyonce will no longer be managed by her father, Mathew Knowles, her publicist said Monday. The Grammy-winning singer and her father have parted ways "on a business level," publicist Yvette Noel-Schure told The Associated Press in a statement. "I am grateful for everything he has taught me," Beyonce said in the statement. "I grew up watching both he and my mother manage and own their own businesses. They were hardworking entrepreneurs and I will continue to follow in their footsteps." She didn't say what led to the split, but her father said in a separate statement to the AP late Monday that the decision was mutual. Knowles has managed his daughter since she debuted as a teen in the multiplatinum-selling group Destiny's Child in the late 1990s and throughout her superstar career as a solo artist. Knowles oversaw all aspects of Beyonce, from music to movies to fashion and more. Her career includes 16 Grammy awards, top-grossing movies "Dreamgirls" and "Obsessed," fashion ventures and lucrative endorsements. The 29-year-old has released three multiplatinum albums — "Dangerously In Love," ''B'Day" and "I Am ... Sasha Fierce" — and has 12 Top 10 hits on Billboard's Hot 100 chart, including five No. 1s. Destiny's Child had 11 Top 10 hits on the Hot 100 chart and six No. 1s. During Beyonce's teen years in Houston, Knowles prepped her, her friend Kelly Rowland and two others for a rising career as an R&B girl group, and Destiny's Child released its self-titled debut in 1998. Their sophomore album, "The Writing's On the Wall," came a year later and garnered multiple hits and two Grammys, but the success also shook up the band and Destiny's Child became a trio with Beyonce, Rowland and Michelle Williams. The three also released solo albums, all managed by Knowles. He launched his own label, World Music Entertainment, via Columbia Records, a division of Sony Music. Rowland parted with Knowles as her manager in 2009 and Williams followed a year later. In the statement, Beyonce stressed her devotion to her father on a personal level. "He is my father for life and I love my dad dearly. I am grateful for everything he has taught me," Beyonce said. Knowles also got personal in his statement. "Business is business and family is family. I love my daughter and am very proud of who she is and all that she has achieved. I look forward to her continued great success," he said. Knowles and Beyonce's mother, Tina, divorced in 2009 after 29 years of marriage. Tina Knowles worked as a stylist for Destiny's Child and continues to style her daughter. Together they launched a clothing line, House of Dereon. Noel-Schure didn't comment on who Beyonce's new manager would be. Knowles said his plans include focusing on his label's work in gospel and inspirational music, where he said the company has made a "tremendous investment."